Our Water Injection System (WIS) improves the stoichiometric ratio and therefore the efficiency of your flue gas treatment (FGT) system. It is a gas conditioning solution that injects water to lower the gas’s temperature and increase its humidity, reducing the amount of reagent required. Our WIS features special nozzles that convert the water into such a fine mist that it’s more like a fog. This offers multiple advantages for an effective and efficient air pollution control system. Why Choose Our Water Injection System? High evaporation rates. Our special nozzles help achieve the highest evaporation rates on the market. Homogenous temperature distribution. Our hundreds of installed nozzles garner an even temperature throughout the entirety of the treated gas, ensuring more effective air pollution control. Allows for a compact layout. Our WIS has an impressively short evaporation time, meaning less duct space is required. Suitable for retrofits. We can add our WIS to an existing system without major layout changes. Indeed retrofits and upgrades are among our specialties. Reduced energy consumption. Our WIS operates with lower pressure losses than other such systems, offering reduced energy consumption. 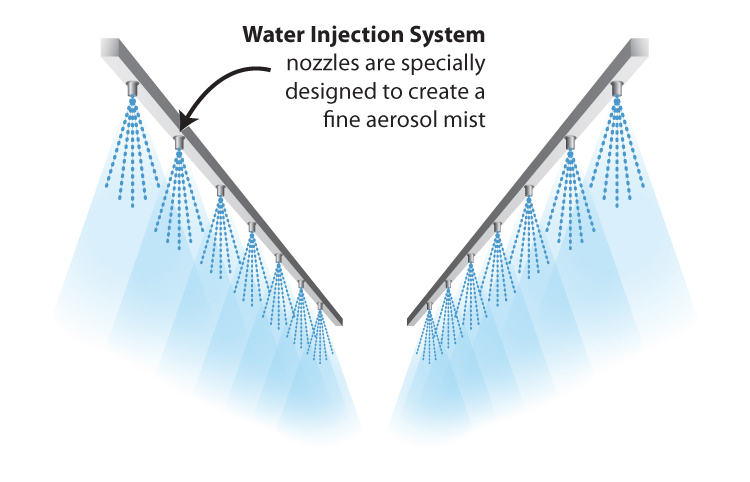 Our special nozzles help our Water Injection System offer an evaporation rate beyond compare: a mere 0.5% or less humidity reaches the bag filter (baghouse). Our WIS also evaporates water more quickly than other such systems: we can reduce the gas temperature by an impressive 30°C (86°F) in less than 2 meters (6.6 ft). 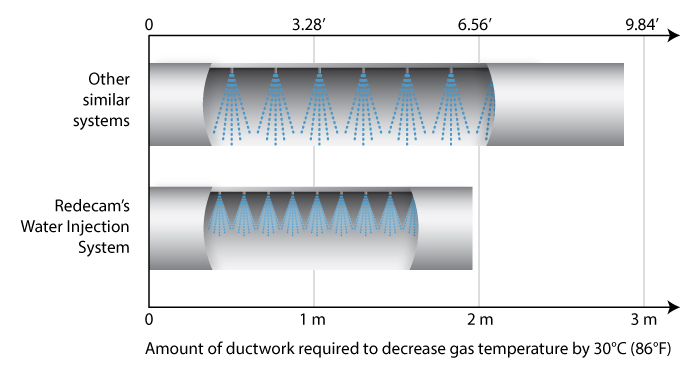 A rapid evaporation requires less duct space and our system can therefore allow for a highly compact layout. We can also ensure no unwanted dust deposits in your ducts. As the mist is so fine, it does not act as a dust pre-separator. Instead, the pollutants are carried off to the next stage of the air pollution control process without landing on your ducts. This also means the system will avoid mud clogs. Finally, our WIS does not require compressed air – the mist is that fine – translating into lower OPEX than other conditioning systems. Click here to view our Water Injection System product brochure. To discuss conditioning systems with one of our experts, please contact us.